Tri-Tec manufactures two gearboxes designed to go the distance. Both Large and Small have tough, ASTM-B-594 bronze or ductile cast bodies and gears. They are built and shock tested to US Navy standards, they mount easily on most valves and are easy to operate. Thousands of these gearboxes are in service in the US Navy today, and require little to no maintenance. 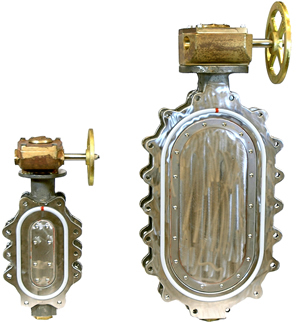 These small gearboxes can meet most of the Navy’s requirements for manual valve operation of small and medium size valves. They are torque tested to 6300 inch pounds. These large gearboxes (large in capability, small in size) can meet most of the Navy’s large valve requirements for manual actuators. These gear boxes are torque tested to 19,000 inch pounds and have the option of adding limit switches. To learn more about small or large gearboxes, please contact us or request a quote today!